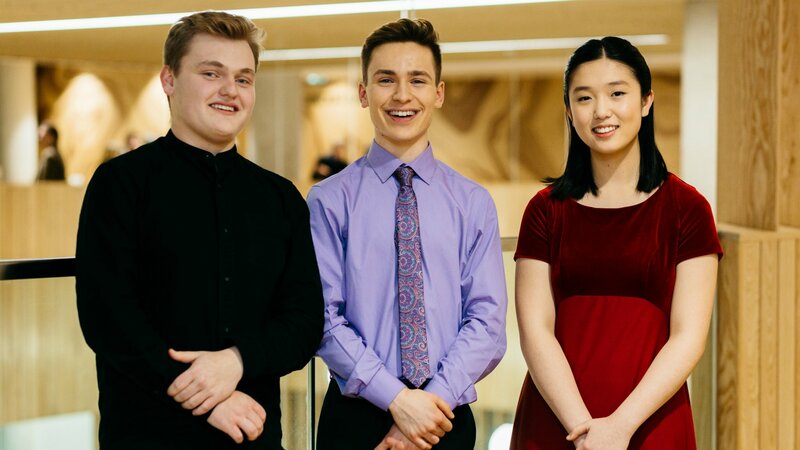 The BBC Young Musician final was a big event in Birmingham. It drew a capacity audience to Symphony Hall, as enthusiastic, engaged and encouraging as any of the competitors could have wished. After the prodigious talent on show in the section finals, it was no surprise that the standards here were sky high. Fortunately, the three finalist were also born entertainers, making for an enjoyable, though excruciatingly hard to call, competition. First up was cellist Maxim Calver (pictured below left), who performed Tchaikovsky’s Rococo Variations (in the standard revised version). Calver has said that he is most comfortable in chamber music, so having to compete in a concerto final wasn’t necessarily ideal for him. But the Tchaikovsky was a good fit, not least for the many moments of intimacy and guarded, tender expression the score offers. Conductor Mark Wigglesworth kept the City of Birmingham Symphony Orchestra to modest dynamics throughout, and the communication between soloist, conductor and orchestra was ideal. There were a few hairy tuning moments in the orchestral strings here, though otherwise the CBSO had a good evening. Calver was also insecure in some of the very high music and the artificial harmonics, though I’ve heard worse from seasoned professionals. But the lasting impression from this performance was of a finely graded balance between the score’s Classical reserve and Romantic expression. Saxophonist Robert Burton (pictured below centre) also picked the ideal piece – no mean feat given the paucity of classical sax repertoire – with the Paul Creston Alto Saxophone Concerto. The work is 1940s neo-Romantic Americana, more Hollywood than jazz, but with plenty of soaring, expressive melodies. In fact, Burton turned everything here into a melody; his bright, rich tone and intelligent phrasing made even the runs and ornaments sound like song. Despite the limited tonal variety of the instrument, Burton was also able to convey a range of colours and moods, aided in the outer movements by some inventive accompaniments from Creston. The composer’s orchestral thinking is more threadbare in the slow movement, with a distinct lack of support from the ensemble. But that didn’t matter to Burton, who was easily able to carry the rich melodic lines unaided. To conclude, pianist Lauren Zhang, playing Prokofiev’s Second Piano Concerto, a feat of unimaginable virtuosity for a 16-year-old, or even for a pianist of any age. In the section final, Zhang had demonstrated astonishing virtuosity in Kapustin, but also an impressive maturity of expression in Rachmaninov. Although she told the cameras that the Prokofiev allowed her to show off both sides, the Second Concerto is more about flash than sentiment. That said, if you can play it the way she does, you should. All the notes were there, and more. Particularly impressive was the way in which Zhang structured the sometimes sprawling paragraphs. The extended first movement cadenza built gradually, with an impressive patience and sense of the music’s scale. The Scherzo second movement wasn’t quite the intended moto perpetuo, but was as fiery and vibrant as anybody could wish. Plenty of drama, too, in the march episodes and jagged offbeat interjections in the third and fourth movements. As we waited for the result, Sheku Kanneh-Mason, winner of the last competition, performed the finale of Elgar’s Cello Concerto, his natural and unassuming musicianship the model for any young musicians to follow. The mood was different here, Kanneh-Mason had nothing to prove, nor had the audience to scrutinise his performance. Even so, his relaxed engagement with the audience felt like the exact quality that the jury were looking for, certainly in 2016 and no doubt this time round as well. The result: the winner was Lauren Zhang. Given the superhuman display of keyboard virtuosity we had just heard from her, that didn’t come as a surprise. She was clearly living the Prokofiev, and there was much more to her reading than just the virtuosity required, even if there were sides to her pianism displayed in earlier rounds that we didn’t get a chance to hear in the final. In fact, all three contestants could easily have taken the trophy, and if I’m honest, I’d have given it to Robert Burton. I have to agree simply with that I wouldn't have chosen Ms Zhang personally. At the end of the day I just thought it must come down to musicianship - meaning feeling, the ability to convey feeling, to make the audience feel music. Me Zhang's technical virtuosity may have been the most impressive of the three. Indeed I even wondered if that may have been why she chose the fiendishly demanding Prokofiev, perhaps lacking confidence in expressiveness. But in the end actually, I may not recall a YM winner who I'd want to buy a ticket to hear play less, who had less apparent feeling of the music. Watching Ms Zhang at 16, by technical prowess I thought I might easily be watching any pianist in the International Leeds competition. In terms of musical feeling though, the opening was promising, but for me the promise dissolved on these terms. The other two did have some good feeling going on - really what music has to be about in the final analysis. Though he may have more work to do technically than the other two, for this crucial, defining element of music making, I had no doubt whatsoever Maxim Calvert was head and shoulders above his competitors. I just thought, in today's world there must be no shortage of young musicians, whether 26, 19, 16 or even 11 years old, who practise endlessly and have as perfect a technical mastery as Ms Zhang. While nothing could change my mind to the belief that it's surely the "something else", a power beyond which really makes the difference in music-making which means something great. All of the three are young and it's often said that it's life experience even rather than hours playing which may give musical maturity in this way. Then again, a lucky few have it from a very early age. For me the best thing I have heard in years was Zhang's semi final with her Rachmaninov'. It stood comparison with greats like lugansky berezovsky and yuja Wang. There is emotional maturity here allied to technical virtuosity. It was spellbinding. The Prokofiev was superb too. I thought the choice of first prize was easier to make than some observers have said.